Q: According to media reports, Khaltmaa Battulga, the President of Mongolia, sent a congratulatory message to President Xi Jinping on the occasion of the 68th anniversary of the founding of the People's Republic of China on September 28. Could you provide us with the detailed information and what is your comment on this? A: As we are about to celebrate the 68th anniversary of the founding of the People's Republic of China, we have received messages of congratulations from the leaders of many countries around the world, including the one from Khaltmaa Battulga, the President of Mongolia to President Xi Jinping on September 28 mentioned by you. We would like to express our gratitude to that. In his message of congratulations, President Khaltmaa Battulga said that developing mutually beneficial cooperation fully serves the interests of the two peoples. The Mongolian side is willing to move forward the China-Mongolia comprehensive strategic partnership based on the principle of respecting each other's core interests. He also spoke highly of the role of China's assistance and concessional loans in the development of Mongolia. We have said many times that China and Mongolia are friendly neighbors and that China always attaches importance to China-Mongolia relations. China stands ready to join hands with the Mongolian side to enhance mutual trust, respect each other's core interests and major concerns, seek greater synergy between the development strategies of the two countries, advance pragmatic cooperation and cultural and people-to-people exchanges and promote the sound and steady growth of the China-Mongolia comprehensive strategic partnership based on the series of political consensus reached by the two sides. Q: Yesterday, Susan Thornton, the Acting Assistant Secretary of the US State Department, told a hearing of the Senate Committee on Banking, Housing and Urban Affairs that the pressure campaign of the United States is aimed at bringing the DPRK back to the negotiating table. Meanwhile, the US has been clear about its strategy towards the DPRK. The US does not seek the regime change or collapse of the DPRK. The US does not seek an accelerated reunification of Korea, nor an excuse to garrison troops north of the Armistice Agreement's Military Demarcation Line. The US has no desire to inflict harm on the long-suffering DPRK people. What is China's comment on this? A: We have taken note of Ms. Thornton's statement. Recently, relevant parties have consecutively sent the positive signals that the Korean Peninsula nuclear issue, in the final analysis, should be resolved politically through dialogue and consultation. We hold an encouraging attitude to this. 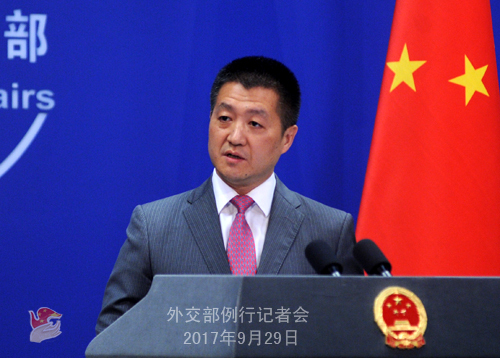 The Chinese side agrees with the Four Nos promise which has been reiterated by the US side many times. We hope that the US side can translate these commitments into concrete actions and that the DPRK can work for the shared goal. We hope that relevant parties can demonstrate utmost sincerity to accumulate conditions for dialogue and create opportunities for peace talks. Q: It is reported that Foreign Minister Wang Yi met with the Japanese ambassador to China. Please give us more information on that. A: Regarding the news mentioned by you, the website of the Foreign Ministry and the media have released and reported the relevant information. I can also brief you on that here. Yesterday, Foreign Minister Wang Yi met with Yokoi Yutaka, the Japanese ambassador to China upon agreement. Foreign Minister Wang Yi said that this year marks the 45th anniversary of the normalization of China-Japan diplomatic relations. Actually, today is the commemoration day of the 45th anniversary of the normalization of China-Japan diplomatic relations. Over the past 45 years, the China-Japan relations have achieved important progress against all odds. We should cherish the dedicated efforts of the older generations of Chinese and Japanese leaders and further improve and develop China-Japan relations. This is the due historical responsibility of the two sides. Foreign Minister Wang Yi also pointed out that it is good news that yesterday Prime Minister Shinzo Abe attended the reception held by the Chinese Embassy in Japan to celebrate the 68th anniversary of the founding of the People's Republic of China. We look forward to more good news on China-Japan relations rather than bad news after the good news. We hope that the Japanese government can adopt a more positive policy towards China, take more actions that are conducive to bilateral cooperation and achieve the sound interaction of China-Japan relations instead of retreating one step after taking one step forward or even retreating two steps after taking one step forward. Ambassador Yokoi Yutaka also made some positive remarks. You can refer to the website of the Foreign Ministry for the detailed information of this meeting. Q: China has recently completed the registration of the 8,000-strong standby peacekeeping force at the United Nations. Could you give us more details about this? A: The UN peacekeeping operations serve as an important means to uphold international peace and security. As a permanent member of the UN Security Council, China has always actively supported and got involved in the UN peacekeeping operations. I have said before that China now has become the second fund contributor and the major troop contributor to the UN peacekeeping operations. In 2015, President Xi Jinping announced a host of major initiatives in support of the UN peacekeeping operations at the UN Peacekeeping Summit, including establishing an 8,000-strong standby peacekeeping force. The Chinese government has always honored its promise with concrete actions. We completed the registration of the 8,000-strong standby peacekeeping force at the United Nations on September 22 this year. Yesterday, the spokesperson of the Ministry of National Defense gave a detailed introduction on the composition of this force. China will continue supporting the UN peacekeeping operations with its concrete actions so as to make greater contribution to world peace and stability. Q: It is learnt that US Secretary of State Rex Tillerson is arriving in Beijing tonight. What message does China plan to convey to him during the bilateral meetings tomorrow? A: Both China and the United States have released the information about Secretary Tillerson's visit to China. I have also briefed you on that here. 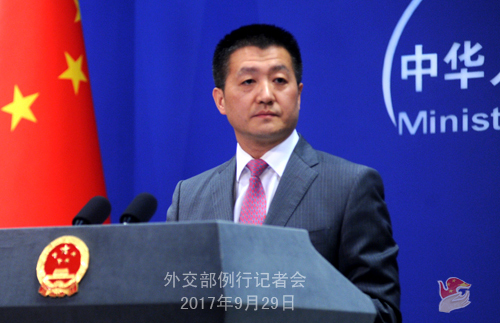 At the invitation of Foreign Minister Wang Yi, Secretary Tillerson will pay a visit to China on September 30. His main task is to have an in-depth exchange of views with the Chinese side on how to strengthen China-US relations, especially President Trump's state visit to China at the invitation of President Xi Jinping this year, and major international and regional issues of common concern. I have said before that if we have further information, we will release it in a timely manner. 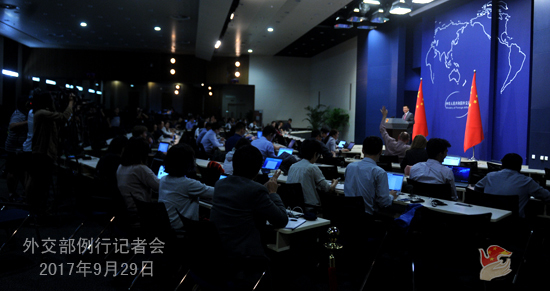 According to this year's holiday arrangement during the National Day and the Mid-autumn Day announced by the State Council of China, there will be no regular press conference from October 1 to 8. The press conference will be resumed on October 9 (Monday). During the recess, the spokesperson's office of the Foreign Ministry will take your questions via telephone and e-mail. Have a nice holiday.